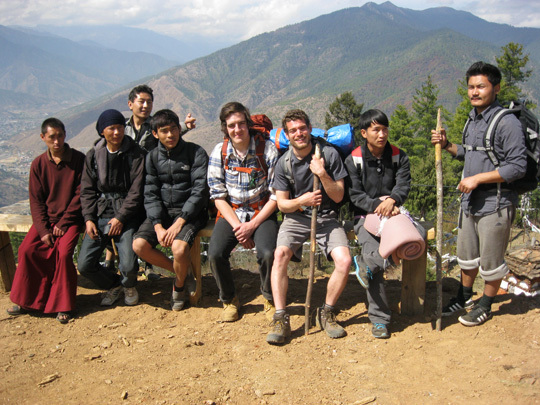 This journey happened about a month into my semester program at Royal Thimphu College (RTC), around March 20th if I can recall correctly. A few good friends who live down the hall from me in Sershom residence hostel, talked my friend Alec and myself into hiking up to Talakha Goenpa (monastery) for the night. 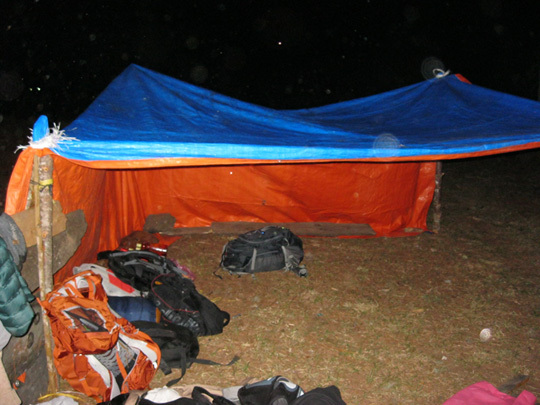 Eight of us gathered what camping supplies we would need, including a massive tarp to sleep underneath, survival gear that I always bring on overnight trips, sleeping bags, cooking supplies, food (including two chickens), and drinks. The birds, pots and pans, rice and other cooking implements went into a big burlap bag that must have weighed 25 lbs on the first day. We set off a little after three pm and hiked down and around the mountain that forms the northern point of a horse shoe shaped series of peaks that extends south east, and envelopes the college campus on three sides. We stopped at a small convenience store that services people who live on the mountain side with essential packaged products like soap, gum and beer. We bought the beer and the gum and were off. The next leg of the journey went up a long paved road that switchbacks up the side of the mountain, leading past one of the many royal palaces, and ending in a parking lot at the edge of the trail used to access the goenpa. We stopped about five minutes up the trail to catch a breather before starting the last two hours of the hike up to the monastery. My friends found a bamboo pipe system that skirts along sections of the trail, uncorked a stick that plugged a hole in the side of the pipe so that we could drink from the natural, pressure powered water fountain. After fooling around for a few minutes, throwing sticks and carving a new piece to plug the hole in the pipes, we set off again. We hiked on a narrow dirt path up through tall old growth, passing what looked like pines that reached nearly a hundred feet up into the canopy overhead. We passed the burlap cooking bag from person to person throughout the hike to give everyone a turn hauling the supplies. This system of slowly developed into two people carrying the load as we reached the end of the trail. We reached the monasteries’ lower gardens around six pm, an hour before sunset. The Tale Goenpa monastery is spread out over the bald top of a mountain, providing 360 degree views of the adjacent mountains that form the landscape in this part of the Himalayas, of Thimphu off to the north, and of the colossal Jomolhari mountain off in the distance behind Thimphu. We moved through the monastery to find our campsite after talking to a monk, who did not pretend to speak English, but helped as a liaison to the monastery, making our stay truly wonderful by providing ample blankets and showing us around the beautiful, simple campus. We found our campsite to be situated in the middle of a yak pasture. I found this to be the case not by stepping on one of the many frisbee sized yak patties that littered the field, but by seeing the yaks themselves, who rolled into the pasture around the same time we did, and were also there to stay the night. With much involved labor we managed to erect a fairly legitimate tarp shelter around four corner posts, closing in two walls against the easterly wind. We built a fire and immediately put on a two gallon pot of ginger tea. The mood of the group was festive and friendly, being comprised of a group of accomplished men that just climbed a mountain and erected camp. We joked and passed around cups of tea, and home brewed ara (rice wine). A group of three men went off with the burlap cooking bag. As I later learned, the monks took them to their kitchen, gave them spices, and helped my friends cook us a feast of different curries and a traditional Bhutanese dish, ema datsi (chilies and cheese), that took us more than two hours to eat. We stayed up late talking about girls, drinking beer and singing old reggae songs that I grew up listening too. At some point throughout the night I went off to find a bathroom in the forest. I grabbed a long stick to help guide me over the unfamiliar terrain. The stick kept me on the path, and helped me to avoid bumping into one of the many yaks that were grazing lazily all around our camp. I brought the stick back to the fire and immediately recognized it as a keeper. I took out my carving knife and set to work relieving a handle from the thick knobby top. We woke up the next morning around ten, had some hot tea, and broke camp. I found the stick that I had been working on the night before, and noticed that it had a road worn end opposite to the handle that I had carved. The walking stick had obviously been recognized for it’s quality by someone before myself. I passed on my old walking stick to a friend, and grabbed the new, perfectly balanced, beautiful piece of dried soft wood. 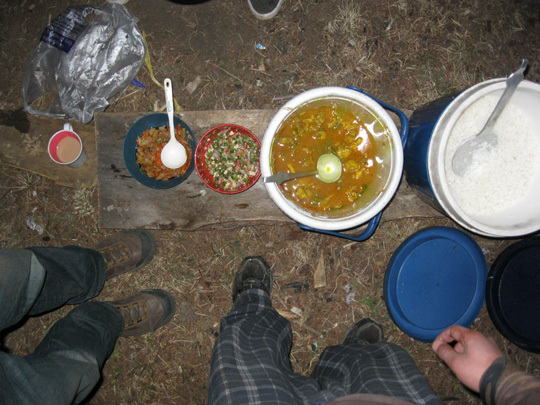 We entered the grounds of the monastery and a new group of three guys set to work cooking us breakfast. Behind the cooking building was a wide arena on which my friends and about fifteen monks were playing khuru, a game that involves 2/3 American football sized darts thrown at small targets roughly twenty meters away. I tried my hand at the game, and found that success required a unique throw to make the darts spin properly and hit the target point first. Even though most of my throws unintentionally put peoples’ lives in danger, the monks were very good-natured and were happy to have a chillup (foreigner) play with them. Despite the insurmountable language barrier, we were able to communicate through body language and common hand gestures. Many enthusiastic ‘thumbs ups’ were passed around to congratulate good throws. We ate a lunch of ema datsi and steamed vegetables in an old part of the monastery, where two fully deteriorated mud and stone walls provided panoramic views to the south and east of the surrounding mountains. After lunch we cleaned the dishes that we had accumulated over the trip and took a walk down to collect holy water from a spring to drink. Once satiated, we walked around to the north end of the monastery, where it was possible to see the sprawling cityscape of Thimphu stretched out a thousand feet below us. We took pictures, taking advantage of the the dramatic background, which I have attached to this memo. 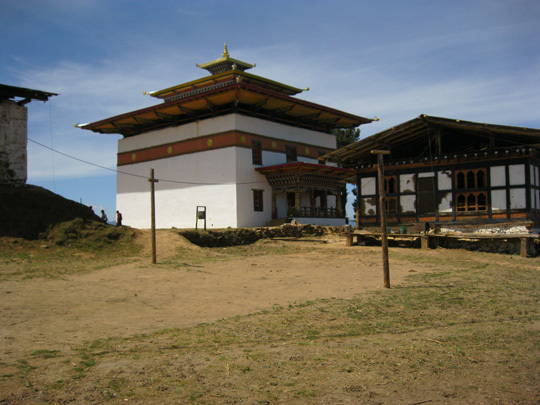 The lhakang (temple building) is located on the north end of the mountaintop monastery. We circumambulated the building three times, an auspicious number, and entered. The antechamber of the temple featured many skeleton paintings. We went inside and basked in the many religious carvings. The monk who was showing us around offered me dice to roll as a tool predict my merit based fate. I rolled eight, the number of the local deity, and my friends congratulated me for the good fortune. I noticed that my friends were not as ‘respectful’ of the temple as our Wheaton group had been taught to be. They snapped pictures frequently, and wandered around touching the various masks and artifacts that furnished the room. As far as I was able to tell, about half of my friend group prostrated to the beautiful representations of deities that occupied one wall of the temple room. We left the temple refreshed and at peace. Wanting to take advantage of the beautiful day, we thanked the monks that had helped us, grabbed our bags, and reluctantly left the monastery. We traveled due south, through our camp and down a trail that I had not noticed existed at the south end of the yak pasture. My new walking stick measured my stride all along a ridge that connected the three mountains that separated me from my new home in RTC.